Novelist Dawn Powell is rediscovered in a kindly biography that also recalls the hard- drinking literati of Greenwich Village in the decades surrounding WWII. Powell came to New York City from Ohio in 1918. She left behind a scattered and troubled family who were the core of her most successful novels, including the popular My Home Is Far Away, published in 1944. What set Powell apart from the thousands of other eager and determined young people who invaded Manhattan was a sharp wit and an eye for character that was both humane and unflinching. 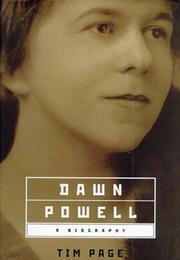 On her arrival in the city, Powell took a series of rent-paying jobs (including a brief stint in the US Navy as a “Yeomanette”), but her writing began selling almost immediately. She also soon met and married advertising executive Joseph Gousha. Although Joe was an alcoholic and Dawn had frequent, albeit for the most part ephemeral, affairs, the marriage lasted 42 years, until Joe’s death. Their only child, Joseph Jr., called JoJo, was autistic, requiring constant attention, hospitalization, and eventually institutionalization. None of this kept Powell from writing—novels, short stories, articles, poems, and plays. Or plunging virtually nightly into the watering holes of Greenwich Village, where she held her own with contemporaries such as John Dos Passos (a good friend), and Gerald and Sara Murphy. Her novels received uneven reviews and for the most part mediocre sales, although she was regarded by critic Edmund Wilson and later Gore Vidal as one of the distinguished authors of her time. She died in 1965 and was buried in a pauper’s grave. A 1987 article by Vidal, published in the New York Review of Books, revived interest in her work and spurred biographer Page (a Pulitzer- winning music critic for the Washington Post and editor of a volume of Powell’s diaries); reprints of most of her novels are now available. Unconvincing in placing Powell at the forefront of mid-century authors, but gratifying to aficionados of New York City literary mores.